DERIVATION: from the Latin grandis for "great" and piscis for "fish," giving rise to the New Latin grampus for "a kind of whale"; from the Middle Latin griseus for "gray." 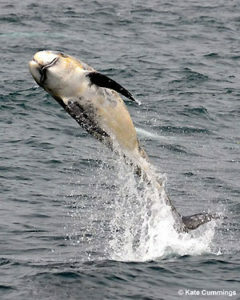 Physical Characteristics: Risso's dolphins, also known as Grampus, are one of the larger members of the dolphin family. Length is typically 10 feet (3 m), although animals have been recorded up to 12.5 feet (3.8 m). Like most dolphins, males are typically slightly larger than females. Weight averages about 650 pounds (300 kg), and large individuals may weigh up to 1100 pounds (500 kg). 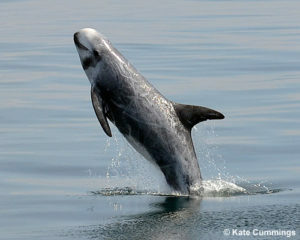 Adult Risso's dolphins are usually dark gray with extensive white scarring. The scars can be scratches, splotches, or circular marks and, in some animals, can be so extensive that the entire body appears to be white. This scarring may come from bites from other Risso's dolphins, squid bites, or parasites. As calves, their bodies are a uniform light gray, which then darkens to a brownish-gray in juveniles. Risso's dolphins also have a white anchor-shaped patch, similar to pilot whales, on their ventral/chest area (from throat to stomach). Life Cycle: While the age at which these animals reach sexual maturity is not known, it appears to occur when the dolphins are approximately 8.5 to 9.2 feet in length (2.6 - 2.8 m) in both sexes, and probably less than 13 years of age. Little is known about calving and breeding, but evidence from the North Atlantic Ocean indicates a summer calving season. Estimated gestation is 13-14 months. Calves are generally 4 to 5 feet long (1.2 - 1.5 m) at birth. Feeding: Reflecting the offshore distribution of this species, primary prey appears to be squid, although they have also been known to feed on a number of fish species. While the size of their squid prey is unknown, squid beaks from species that grow up to 12 feet in length have been found in the stomachs of stranded Risso's dolphins. Behavior: Typical groups of Risso's dolphins are 3-30 animals, although "super-pods" of up to several thousand together have been noted. However, recent studies indicate that groups may be stable, and may consist of related individuals (especially females), although this has yet to be confirmed. They typically travel side by side and are fairly active. Observations of leaping, spy hopping, fluke slapping, and flipper slapping are common. They are long-lived animals that live an estimated twenty years minimum and possibly up to twice that long. Risso's dolphins also form traveling pods at sea with other dolphin species, and hybrids between Risso's dolphins and bottlenose dolphins have been recorded both in captivity and in the wild. Distribution: Risso's dolphins tend to prefer offshore habitats worldwide in the warm temperate and tropical waters of both hemispheres. They are not known to enter true polar waters, and northern-most records are Newfoundland and the Shetlands (Atlantic), and the Gulf of Alaska (Pacific), while southern ranges are Cape Horn, the Cape of Good Hope, Australia and New Zealand. General migrations are not known, although some individuals may shift to cooler waters during the more productive summer season. Regional variation in movement may be related to local environmental changes, especially warm water occurrence, and shift in prey abundance. Threats and Status: While formerly thought to be rare, this impression probably resulted from the typically offshore distribution. In fact, the species is probably abundant throughout its range, although no exact numbers are known. 13,000 - 30,000 animals are estimated to occur off of Central and Northern California. In a few parts of the world, Risso's dolphins are killed for human consumption; until recently, they were commonly found in the open market in Taiwan, and they are part of Japanese drive fisheries for dolphins. In Sri Lanka, they are one of the primary species taken in a gill net and harpoon fishery that may have grown out of selling accidentally netted dolphins. In most areas of the world, however, they are not currently under major threat from direct killing, but may be susceptible to accidental fishing gear entanglement and pollution from coastal development.